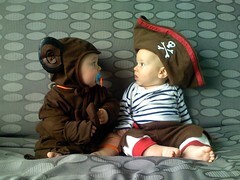 Shivering your business timbers - Rescue Marketing, Inc.
Today is Talk like a Pirate Day (TLAPD). In honor ofÂ such a fine day, a few thoughts, er I mean… Aye, what would a pirate do t’ strenghen your business today? A pence for an old man o’de sea? First, how about sliding over to Mashable and look at their tips for celebrating Talk like a Pirate Day… and then come back here for some pirate advice before you get business scurvy, matey. Great ideas for celebrating the day, but bummer – your business is open on September 19 every year. Now what? Wasn’t that awesome Mashable post a great example? Mashable is a tech news blog.Â See how they took TLAPD and turned it into their own – while doing exactly what they do best? So…what can you do to (here it comes *again*) use the news (calendarrrr, whateverrrr) to make your business stand out on this fine, fun day? Maybe by the time you see this, it’s too late. OK, some examples are in order to get your creative juices flowing. Maybe you make custom coffee mugs for the day that you only use on Talk Like a Pirate Day. Or you order a gross of them for cheap and give them away with today’s purchases. Of course, the mugs will have a silly pirate image, your phone number, URL, etc. If you own a boat store, raise the pirate flag, silly. Dress everyone up like a pirate, or have some temps come in and dress up like pirates. You of all people should be able to hit this one out of the, uh, dungeon. Own a lingerie store? If you can’tÂ see some great ideas to getÂ publicity using TLAPD and some temp models, you really need a cuppa joe:)Â Hint: Imagine it was Talk like a French Maid Day. Now translate that to pirate. Run a computer store? What a great time to have a “Bring your computer in and scan it for pirates (ie: spyware etc) Day”. Or to have an event that educates your clients about software piracy (find a smart way, please), or similar. Develop software? What a GREAT day to offer amnesty to anyone who pirated your software and is ready to come clean. They liked it enough to steal it and keep using it, now they’re convinced that they have right product. Help them buy. Don’t embarrass them. Do you run blood drives? Put your “I donated” stickers on toy eye patches. You can get half a million of them for $3 at Oriental Trading (well, close) or make them yourselves (a fun event for kids). Dress everyone up. Don’t be so boring. It’s just blood. No matter what you do, make a fuss…matey. PromoteÂ your event far and wide, have some fun with it, dress up your staff or those temps I mentioned and be that purple cow.